Students from BTEC Level 3 Hospitality, Year 2, raised £502.10 through a range of mini events within The Graduate Restaurant, Southern Regional College. Students planned, organised and ran events as part of the many themed dining events hosted within the college. They presented their cheque to Niamh Collins, PIPS, Newry and Mourne. In support of their achievements is Anne Murray, tutor. 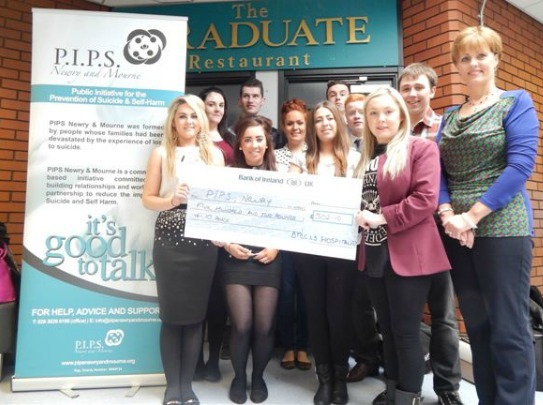 PIPS Newry & Mourne would like to thank all the strudents from BTEC Level 3 Hospitality on their very kind donation.